“The study of agriculture should be something more than a study of its economic problems. It should be educational, moral, political, religious and social as well. It should be remembered that good farming is only a means and that good living is the end to be attained,” said George Von Tungeln, Iowa State rural sociologist, writing in a 1918 research bulletin on the social survey of 142 rural families in Black Hawk County. It was one of the nation’s first rural community surveys. Iowa State researchers George Beal and Joe Bohlen began the tradition of applied research for which the sociology department is known. They described the adoption of a new product or technology according to a bell curve that characterized groups, including “innovators” and “laggards,” based upon the speed with which they adopted. In addition to their pioneering work on the adoptions of new ideas and innovations, they also studied organizational effectiveness, including communication and the strategy of community action. Beal and Bohlen traveled and consulted extensively in the 1960s and 1970s to explain the concepts of adoption and diffusion and community action. 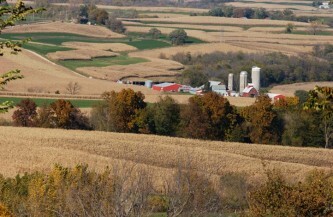 The Iowa Farm and Rural Life Poll is an annual survey of Iowa farmers that was established in 1982 to provide timely and relevant information on agriculture and rural life. The sociology department at Iowa State manages the survey, which is a cooperative project of the Experiment Station, ISU Extension and Outreach and the Iowa Department of Agriculture and Land Stewardship. A variety of issues are examined through the poll: including opinions about current agricultural policies, land stewardship ethics, assessments of the future of farming, research and extension education needs and priorities, the incidence of off-farm employment and plans for the future. Information from the poll is made available to local, state and elected officials, community leaders, farm organization leaders, policy makers and other groups that have a stake in the vitality of agriculture and rural society. Information from the poll is used to guide policy decisions and actions and as the basis for public policy seminars, extension reports, radio and television broadcasts, and newspaper and journal articles. A researcher at Iowa State developed a tool in 2009 to determine what market conditions are needed for ethanol producers to make a profit. David Peters, an assistant professor of sociology, created an ethanol profitability calculator for local communities, investors, policy makers and others to better understand the profitability of ethanol plants under market conditions. An Iowa State-led regional project is in its third year of research examining long-term impacts of climate on Midwestern corn crops. The Climate and Corn-based Cropping Systems Coordinated Agricultural Project is funded by a $20 million grant from the USDA’s National Institute of Food and Agriculture. Lois Wright Morton, professor of sociology, is the project director. She coordinates a 140-member team across 10 land-grant universities and a USDA research unit in nine Midwestern states. The team includes agronomists, agricultural engineers, environmental scientists, hydrologists, soil scientists, sociologists, watershed engineers and natural resource scientists, as well as extension educators and staff.